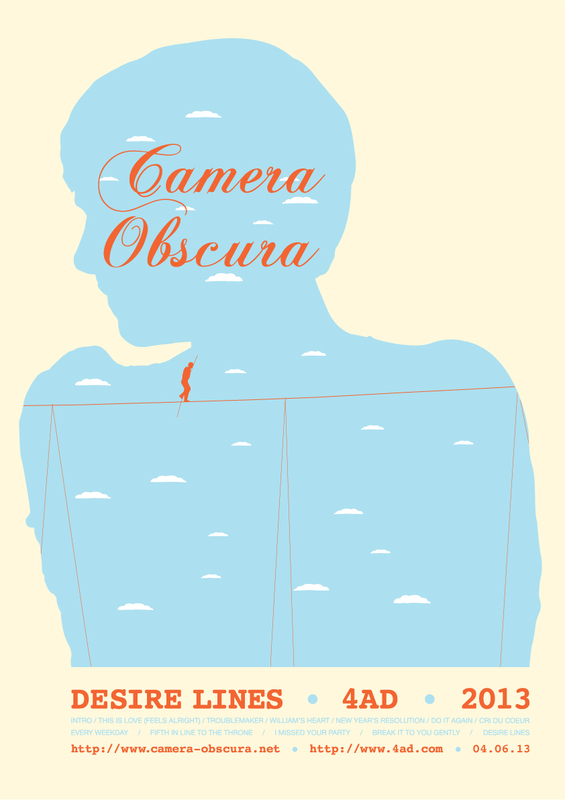 Interview with Tracyanne Campbell, Camera Obscura. This magical beauty inherent in the making of music is forever to the foreground when listening to Glasgow’s Camera Obscura. They have firmly established themselves as one of those rare treasures in music today. Over the years, they have mastered the art of a perfect pop song, where each record has become a cornerstone to music lover’s record collections worldwide. What lies at the heart of their blend of precious pop music is the remarkable voice of Tracyanne Campbell. Like fellow-Glaswegians, Belle & Sebastian, Tracyanne Campbell and co. write irresistible songs about love. The stunning compositions over the years, ranging from heart-wrenched ballads (‘James’, ‘Desire Lines’, ‘Country Mile’) to Spector-esque pop symphonies (‘French Navy’, ‘This Is Love’, ‘Lloyd, I’m Ready To Be Heartbroken’), have dealt with the universal theme of love, in all its strengths and flaws. As with all true artistic creations, an emotional depth exists at the core of Campbell’s penned songs, creating in turn, deeply affecting pop music. Pain, longing, hope, fear, loss and heartache are beautifully etched on the canvas of sound. A rare treasure indeed. The lyric of ‘”The Heart Is A Lonely Hunter”, I feel epitomizes the music contained on ‘Desire Lines’. In much the same way as the idea of desire lines, where the compass of your heart guides you to new pathways and possibilities, the sheer poetry of Campbell’s lyrics heightens all your surroundings. As Campbell sings “I’m going to love you as I know how” on the song’s chorus, a sun has risen on the skyline before my eyes. It’s music to truly savour and appreciate. ‘Desire Lines’ was recorded in Portland, Oregon by producer Tucker Martine (Laura Veirs, REM, The Decemberists, Sufjan Stevens), having first written and composed the songs in their native Glasgow. The timeless power of pop music graces these very songs with the endearing and everlasting appeal of all things rare and true. A formidable cast of musicians guest on the album, from the pedal-steel prowess of Paul Brainard (Richmond Fontaine among many others), Neko Case and Jim James on backing vocal duties. The ensemble musicianship of the group’s core five-piece lineup creates the perfect backdrop to Campbell’s songwriting. ‘New Year’s Resolution’ contains glorious touchstones of soul and pop that has a feeling of nostalgia permeating through Campbell’s masterful lyrics. The closing refrain of “Stay now / I wish you would stay now” brings the song to a fitting close. ‘Fifth In Line To The Throne’ is one of the album’s centerpieces, alongside ‘Cri Du Couer’ and ‘Desire Lines’. For me, the ballads often are the songs that I hold most dear to me, from all of my most cherished records. The song has it all. The feel. The depth. Such power and beauty. I think there is a lovely parallel between ‘Fifth In Line To The Throne’ and the songbook of The Smiths. The distinctive blend of mesmerizing instrumentation of guitar bears the hallmarks of Johnny Marr. The voice of Campbell shares the glorious spark of Morrisey and particularly, the song’s phrasing. My favourite lyric on the album ‘Desire Lines’ is “I have seen your deepest flaws” on the opening line of the second verse. It’s beautiful how such few words can make such a profound impact. I am reminded of Morrisey’s songs such as ‘I Had No One Ever’ and ‘There Is A Light That Never Goes Out’ when listening to this tower of song. The purity of Campbell’s voice is simply breathtaking, where the heavenly instrumentation of guitars, drums, keys and backing harmonies, makes for a fulfilling journey. The origins of Camera Obscura happened sometime back in 1996 in their Glasgow hometown, where founding members Tracyanne Campbell and Gavin Dunbar first began rehearsing together. Their career has spanned two decades, releasing several timeless records that has been championed by the late great John Peel, who welcomed the band to do five Peel sessions. A testament in itself. Debut album ‘Biggest Bluest Hi-Fi’ was released in 2001, with the follow-up ‘Underachievers Please Try Harder’ further developing their unique blend of intelligent pop music. On the next two records, Swedish producer Jari Haapalainen came aboard, whose acclaimed work included The Concretes and Peter, Bjorn & John. The albums ‘Let’s Get Out Of The Country’ (2006) and ‘My Maudlin Career’ (2009) are both milestones in the band’s universally acclaimed body of work. 2013 sees the band create yet another work of art in the form of ‘Desire Lines’, where the pathway continues to lead us to new horizons. “The image of my dad that will stick in my head for the rest of my life is the one I saw over and over again. He’s in the middle of the living room on his knees, gently rocking back and forth, humming and making little comments and sounds as he listens to an album alone. His head bent down, reading the linear notes. Of course, everybody has their own paths they undertake in their quest for building a record collection; bands, labels, producers, sleeves, genres, a particular timeframe or decade, rarity, value, recommendation etc. Whilst not forgetting the beauty of chance and serendipity, the process of finding one’s way through a universe of music – new and old – is endless. While I can only roughly estimate what my own record collection will comprise of when perhaps one day a new generation will curiously seek to unearth music from a bygone time, I know one thing for certain: while young ears will seek to hunt out new music, I will happily point in the direction of those records by Camera Obscura. “Who?” I imagine will come the response, when I will reply: “Camera Obscura, a band from Glasgow, who, at the start of the 21st century made some of the most beautiful records I’ve ever heard.” And with a satisfactory, silent nod, new, unfamiliar sounds will begin to fill the room. And what could possibly be a more beautiful pathway – and desire line – than that? “Desire Lines” is out now on 4AD. (This interview took place on the eve of Camera Obscura’s U.S tour in support of new album ‘Desire Lines’). Congratulations on the new album, ‘Desire Lines’. It’s really amazing, and I think it’s your best album so far. That’s very nice for you to say so. I was interested to see you went to Portland, Oregon for the recording of this album. I’d love to know more about the songs themselves, whether you had them pretty much written before you headed out? I think that’s always really the case when we’re making records, you know. If you don’t have a lot of ground-work done then you’re basically spending money in a very expensive studio to write songs, so that’s not a good way to spend your money, you know. They were mainly written – there may have been an odd thing here and there that wasn’t set in stone-the basic structure and basic chord progression and basic vocal melody and basic lyrics were there. There was the odd thing that finished off in the studio but we had them finished in Glasgow. Tucker Martine, the producer came over for a couple of days and we set the tempos and stuff like that and then we practiced on that and we went to Portland and recorded them. The only song that really changed structurally in the studio drastically was the first song ‘This Is Love’ ’cause that wasn’t really working out when we came to track it. We weren’t quite happy with it so I wrote a new chorus in the studio. My favourite song at the moment is ‘Cri Du Coeur’. It has a lovely feel of Roy Orbison. Yeah, well I think we were going to this sort of classic 50’s American style but with something that was a little bit more contemporary at least, and less pastiche or retro than usual. Over the years too, I love the songs on your albums that are the slow ballads. On this album I feel the title-track is really strong with a deep impact. I love that feel to it. I think that quite often for me on albums, my favourite songs end up being maybe the less obvious singles, you know. I think a lot of the time they are more interesting and have got hidden depth. I’m glad when people say they like those tracks, you know as someone would like songs like ‘Do It Again’ or ‘French Navy’ because they are the sort of tracks I look for in people’s records as well. Camera Obscura are so brilliant at creating pop songs, in the true sense. There’s always very much a real feel to them and real depth to all the songs. You must have specific albums or bands that you’re really inspired by? It’s hard to pinpoint. I do have bands and albums that I love but it’s hard for me to draw a line directly on the records I listen to along the songs that I have written. I don’t think you set about going, I really like that song, I want to make a song like that. It doesn’t work like that, I think your influences are with you along the way, you keep them with you and you’re not always aware that you’re using them. In terms of the arrangements, you can never tire of the layers of sound embedded in the songs themselves. Is that I suppose more the final stages of the song? I think strings and brass and things like that, for us have always been added last. Definitely the band record live and we’ll get a basic song and we’ll do our overdubs on our particular instrument. We never really put many strings on this album. We purposefully avoided that ’cause we didn’t really want to go down that road. And we’ve obviously used a lot in the past. They may have been written in mind during the recording but they’ve always been added later on. How has your touring been going? Primavera Sound must have been unbelievable, what a lineup. It was a good lineup. It’s been a long time since we played Primavera. We played about twelve years ago. It’s one of our first proper gigs, actually, one of our first gigs outside of the country definitely. So it was nice to go back there, having progressed a little bit more, on the ball a little bit more. It was really great. It was lovely to play in Spain and we always get a really fantastic reception when we play in Spain probably due to previously being on Elefant records in Madrid. Did you get to see any band yourself while you were there? I have to confess I did not see any other band. I was quite busy doing press before the gigs so yeah, I never really got a chance. I guess the main person I would have liked to have seen was Rodriguez but actually he cancelled. It’s nearly always the way with festivals, it’s very rare to see bands. The title of the album, ‘Desire Lines’, I’d love to gain an insight into the title? It’s a lovely title for the album. Well, the song ‘Desire Lines’ was one of the first songs written for the record, if not the first because I wrote it when I was on tour in 2009. We just played Coachella. Again, I was being a bit of a bore and instead of staying and watching other bands, I decided to go on the bus back to the hotel. I sort of had a dream in my head and sort of the idea of the heart following the head and the head following the heart. Sometimes they’re like paths that don’t quite meet, where like being on one path instead of being on the other. And then I thought about that whole desire lines thing, you know, in public places where instead of going down the path that’s been laid out for them, they sort of wander off and they end up making a new path. And then people follow it and it becomes a proper path that people have followed. It’s quite difficult to explain but I was thinking just about the sort of idea of the choices you make, leading you somewhere and that kind of thing. I love the lyric “the heart is a lonely hunter”, you must be a big fan of Carson McCullers? 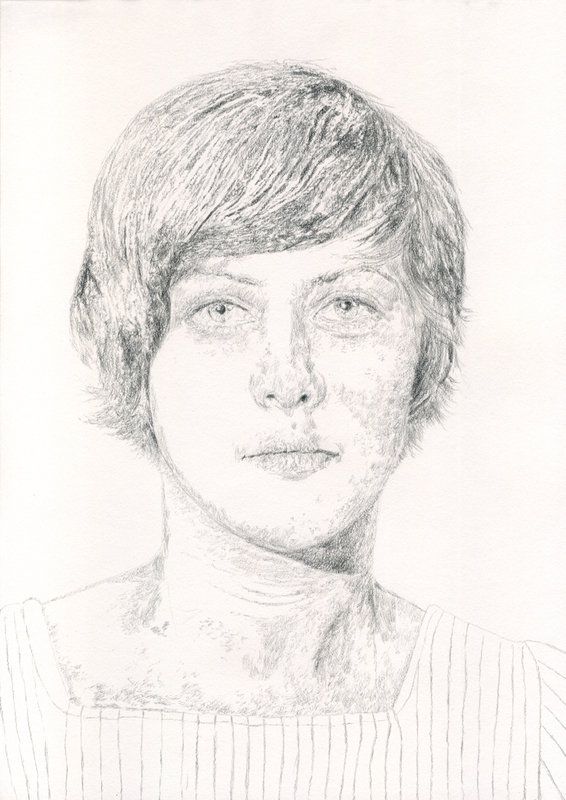 Yeah, I read a lot of Carson McCullers on the last American tour which was back in 2009. I loved that book, I was quite taken by it. And obviously that line is quite evocative and I guess the idea of tying it in with desire lines is the thought of the heart on this fruitless path to somewhere. So I guess that was the meaning; looking for something that was never going to bring them any joy or solve any problems. But I love Carson McCullers. You’re on your U.S. tour tomorrow, Tracyanne? I just started to do the dreaded packing. So, we leave Glasgow at 9AM and to tour for two months. I’m looking forward to it. It should be good. It’s been a while. It must be lovely, with music to tour around the different parts. I think we’re really lucky, you know. We feel very graced in that we get to travel. Obviously there are different aspects to that but actually, mainly it’s a great privilege to catch other people’s existence, basically. It’s really fascinating and I think for me personally, I’ve drawn great inspiration from the States especially because we have toured there so much. I think that a lot of the songs written on the past three albums have definitely drawn great inspiration from the States. I don’t think that half of those songs would have materialized without those trips. I have a great fondness for it, you know. It means a lot. I hope you’ll come over to play Europe afterwards. Yeah, I think that will be later on next year. I’m actually five months pregnant, so I’m due to have a baby in September. Obviously, I need to take a bit of time off and get back into it. We really want to go all over. Sadly we only got to do one small section of the UK but hopefully next year we’ll be able to get a lot more done. That’s great. The last time I saw you was actually in Cork, alongside Midlake and Grizzly Bear. That was a nice show. That was great actually, I like both those bands, especially Midlake. It was a real treat for me to actually play a gig and then watch a band I really love. It was lovely.